Rental yield calculator: What return on investment can you expect to achieve with your buy-to-let property. When you're trying to decide whether to purchase a buy-to-let property, there are lots of factors to consider. You need to think about things like average rental prices in the area, how much the property will cost to maintain and upfront legal and search fees. This is true for new and experienced landlords alike - the housing market is constantly changing, and government policy changes like the recent change in stamp duty have made it more difficult to judge how much money you stand to make from buying a property to rent out. The most important figure for you to calculate is probably the rental yield. This is where our investment calculator comes in handy - just enter few details about the house price, rental price and any one-off or recurring fees and we'll tell you what your buy-to-let yield will be. If you're still not sure where to start, we've also put together some information about the areas that offer the best buy-to-let yield in the UK. Our rental yield calculator is free, quick and easy to use - it works on desktop and mobile, and there's no need to download additional software. We don't store any of the details you enter. While other buy-to-let yield calculators just calculate your house price versus your rental income, we have fields for the rest of your potential outgoings in the first 12 months of purchase - allowing you to get a more detailed picture of what to expect. It's very simple - the calculator works by subtracting all of your outgoings from your annual rental income based on the figures you put in, which means that even if your situation changes, you can easily calculate your yield. 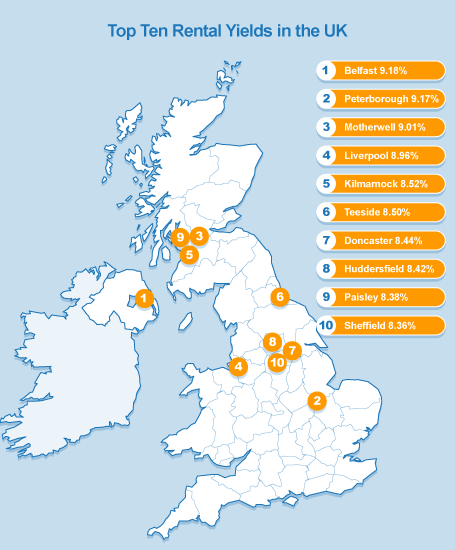 Based on data from Home.co.uk, we've compiled a map of the highest buy-to-let yields in the UK. So, whether you're shopping around to find the best place to purchase your first buy-to-let property, or wondering how your existing rental yield stacks up against elsewhere, you've come to the right place. As you'll see from our map below, Belfast (BT56) offers landlords the best chance of getting the highest rental yield, with a potential yield of 9.18%, closely followed by Peterborough (PE3) and Motherwell (ML9). The highest potential yields in England are to be found in Northern Ireland, the north of England and Scotland, with nine of the top ten being located above the midlands. Perhaps unsurprisingly, London and the south coast don't feature at all in the top ten, with the southernmost postcode being PE3 in Peterborough. The table below illustrates the Top 50 areas for buy-to-let rental yields in the United Kingdom. Liverpool and Kilmarnock post codes came up most frequently, with six entries in the top 50 each. If you're looking to make the most of your money, the lowest average property price is to be found in Liverpool at £53,571, while for bigger spenders the highest average in our top 50 is £195,000 in Edinburgh. However, this is also where the highest average yearly rental (£16,308) is to be found, so if you can afford the initial outlay, you could be looking at a potential yield of 7.95%. Take a look at the table below to see the other areas that make up the top 50. Estimates of average other costs based on Which? 'Buying a house' information page. Average house prices and rental information provided by Home.co.uk on 30th May 2016, based on two bedroom properties only. Mean averages for each area used, with those areas where statistically significant data was not available removed from consideration. 1. What is rental yield? Generally speaking, the higher the percentage, the better your investment. 2. Why do I need to calculate yield? It's important to calculate your buy-to-let yield so that you can be sure that purchasing a property to rent out is a good investment. Through your rental income being higher than your total recurring fees such as maintenance costs or mortgage repayments. Rental yield helps you to calculate whether your income is larger than your outgoings, and gives you a percentage figure to illustrate how quickly you will see return on investment on your BTL property. 3. How do I calculate rental yield? Multiplied by 100, to find your percentage yield. 4. What is a good yield? A good yield can be anywhere from 3 or 4% to over 11%, it just depends on your circumstances and investment goals. Do some research into the average yield in the area you're buying in, and think about how you can cut your outgoings to make the most of your potential yield. 5. What factors might influence the yield? Your monthly fees – maintenance fees, mortgage payments and landlord insurance can quickly add up. Remember – every outgoing is influencing your potential yield! Property structure – For example, if your property is in a student area, it might be more lucrative for you to convert some of the living space into extra bedrooms, or to rent the property out room-by-room. Just bear in mind that this may have an influence on how much you have to pay out for insurance and maintaining the property.